Inside: How To Manage Dinner Prep Time As a Mother. Tips for making preparing mealtimes easier and possible when you have little kids. Once you have children, prepping dinner has to be one of the most stressful times of day. It is toward the end of the day so people are getting cranky (all people–adults and children), dinner is approaching, which means hungry people, which also means potential grumpy people, patience may be wearing thin…and this is all made harder when you have a baby to work around. Babies can’t be made to wait like older children can, and even babies who are on predictable routines can get off routine at times. Dinner prep might also be the start of witching hour for some babies. When we had just one child, it wasn’t a big deal. I don’t really think dinner was at a terribly consistent time of day–Brayden had his dinner on time and we just ate when the time seemed convenient. Plus my husband was working full time and going to school full time, so his schedule wasn’t exactly what you would call consistent. When Kaitlyn and McKenna were babies, my husband worked at a job where he got home at 4:20. He would get home, I would start dinner, and he could act as back up if the kids seriously needed something. He now works a job where he gets home later, and I like to have dinner ready or close to being ready when he gets home. We also have the excitement thrown in there of sporting games that sometimes start about five minutes after he gets home from work, so I have to be able to manage getting dinner ready on time. Here are some ways I manage dinner prep time at my house. 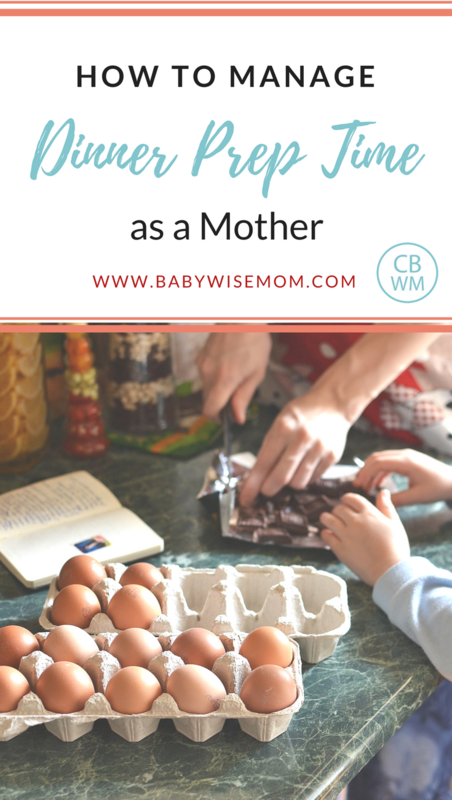 When I have a baby who is unpredictable, I will often do any chopping and other food prep I can do earlier in the day. I find the time of day I am making dinner is usually the most likely to have disruptions for the baby or a time for older kids to suddenly need me, so I find it easier to have things prepped ahead of time. Brinley is currently ten months old and I don’t have a need for this tip anymore–she is extremely predictable and past the age of disruptions–but I used it often during the first six months of her life. Find ways to keep your children occupied. There are a lot of options here. You can do independent playtime during the time you are prepping dinner. See Index: Independent Play for more on what that is. You can have table time activities during the time you are prepping dinner. Table time activities are activities your child can do at the table. This is a structured playtime activity. One note, if you choose to do this, it will be most helpful to you if you do activities that your child can do independently. Play doh can be a good one, too, if your Play Doh toys are age appropriate. You don’t want activities that your child will be asking for lots of help with (trust me, I have made this mistake. It makes dinner prep that much more stressful). Coloring is a great activity that most children can do unsupervised. You can also have several “busy bag” activities for your child to do. For fun ideas, look through the blog I contribute to, Children’s Learning Activities. You can also have your child help make dinner. I like to have one child on help make dinner with our chore wheel (see Chore Wheel). 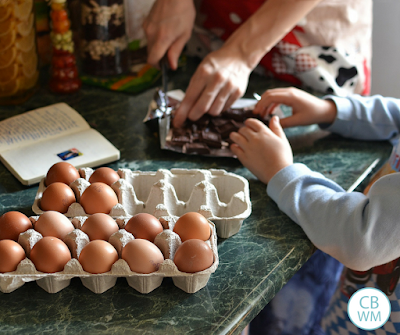 I like having just one child help because I can focus on teaching age-appropriate cooking skills to that one child. I often plan television time for during dinner prep. Prep during nap time. Have a child sleeping or doing rest time while you make dinner. You can also have children do homework, practice piano, or do chores while you make dinner. So right now, most days I have one child helping me, two children watching television, and one child sleeping during dinner prep time. Some times I have the children all play together. Sometimes I have kids doing crafts at the counter while I cook. Kids get hungry pretty early in the evening. We eat dinner right around 5:30 each day. If you have a later dinner and your child is having a hard time waiting for dinner, have a snack in the late afternoon to hold the child over. A difficult thing I have found with snacks and children as they get older is that they think they need to be full–so a light snack is not satisfying for the child. I just explain to my children that they don’t need to be full and dinner will be ready at 5:30 and they can eat then. If you do a snack, just keep it healthy so if it makes it so they don’t want to eat as much dinner, you won’t worry. I allow any fruit or veggie or cheese for an afternoon snack. I don’t allow whining about being hungry for dinner (not that the ban is always observed…). When they do whine, I remind them that if they want dinner to be done sooner, they need to ask me how they can help rather than whining at me about it. Helping helps them see progress is being made and it helps them appreciate that snapping fingers doesn’t produce food. I hope this will also teach them to have consideration for others so when they want things in the future, rather than standing around and whining about it, they realize they need to step up and take some action to make it happen. So what about when your best plans and intentions still couldn’t remove the suddenly fussy baby from happening? Some people will put their baby in the front carrier, bouncer, or swing and let baby nap there or wait there if content. You can also stop the cooking process if possible and have dinner be later that day. It isn’t always ideal when that happens, but remember it really is a short season. The minutes creep but the weeks fly by. If you have older children, you can also have one of them hold the baby or play with the baby. I think it is a great thing to allow them to help when they can! When you run into that growth spurt week or a hard fussy day after vaccinations, it can be nice to have freezer meals on hand you can use for dinner. You can also have some pre-frozen food you buy at the grocery store; it isn’t my favorite thing to feed my family, but sometimes you have to cut yourself some slack. Again, it isn’t forever and it isn’t every day. You can also get some take out. My kids love nothing more than a pizza night :). Give yourself some grace and remember the point in the post “Slow the Pace.” You don’t have to be superwoman every minute of every day. It is okay if you need to lighten your load some days–that is the wise thing to do. What about you? What have you found to be helpful while you are getting dinner ready? I love plantoeat.com! It isn't free, but they occasionally have a 50% off deal. It categorizes my recipes, allows me to plan them for any meal or snack, I can also add notes to the plan or add a separate ingredient, and best of all, it automatically gives me my shopping list remembering what store I buy the items at based on my plan. It's even organized by section! This has helped me so much in planning and not forgetting things at the store. I would love if you would post some of your quick and easy recipes, especially the slow cooker ones! I am always looking for new dinner ideas! I love the slow cooker too! It's so nice to have most of dinner done by late morning. What a fabulous post! I used that prep-early-in-the-day tip for the first year of both my children's lives. I like your approach to the snacks, not needing to be full in the afternoon, and banning the whining. Very helpful. I also use TV time most days for my oldest (5). He loves to help me in the kitchen, too. My daughter is 20 mos, and still in the witching hour phase. It does help to give her a snack, and sometimes a plastic bowl and wooden spoon keep her busy. I really like the idea of table top activities, too. Thanks for sharing that Jessie! Good idea Stephanie. I will do that! Thanks Kristy :)Thanks for sharing your ideas Angela! dinner prep was the most stressful time of my day. you are right.. all the kids are home, tired maybe, sometimes fighting too! and i felt really guilty about using the tv as a babysitter, but i guess, it is a necessary evil! :Pthank you for this post. A few weeks ago I printed off a meal planner because I am finally realizing how much easier it is to have one! 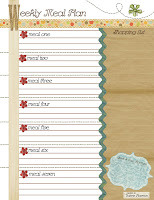 The one I use has a shopping list attached to it with categories (dairy, dry goods, etc.) I like the categories because it even helps keep me organized when I'm shopping. 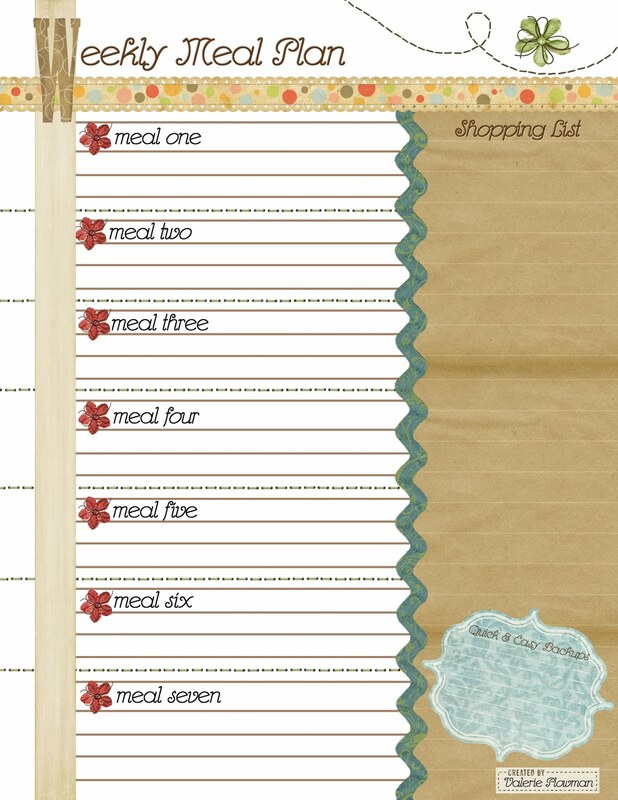 When I use the meal planner, I find it SO much less overwhelming to get food on the table! Freezer cooking became my way of cooking 7 years ago. I'll never go back to cooking full meals every day. I freezer cook with a friend every other month or so. We do all the planning, shopping, and cooking together. LOVE it! Most week nights there is very little to no work to get dinner on the table. There are so many great freezer cooking recipes online. We've also adapted many of our favorite recipes as well. Julie was that free? If so, you should post a link so people can print one if they like that system! Thanks for sharing. Danielle I think that sounds awesome. It also sounds overwhelming to me for some reason! But I do like to double a recipe and freeze one meal and have 2-4 in the freezer for those days I need a fall back! Thanks for sharing that.